Zoe is almost 10 months old, and is totally in love with shoes and sunglasses. She refuses to wear shoes, but she is fascinated by everyone else's. 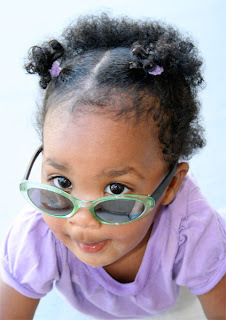 She has always been obsessed with my sunglasses, trying to take them off my face the second she sees them and grinning huge whenever I tease her by putting them on her. 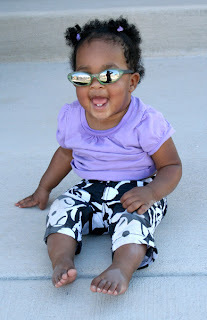 The other day, my friend, Joy, gave Zoe these really cute sunglasses. I didn't think she would ever wear them, but I couldn't have been more wrong. She loves them and awards me with a big smile the second I put them on her. Sometimes she takes them off, but usually she will keep them on for a really long time. It is funny to watch her because she is so proud to be wearing them, and she looks adorable. One of my favorite things about them is that her nose is not very good at holding them up, so they are constantly sliding down. She is always looking over them. I love it! wow, i bought dorian some little sunglasses and he just pulls them right off. i cannot get him to leave them on. i love that last picture. she is darling. You gotta love the whole look. The clothes, the hair, the sunglasses, and the attitude to match. She's really workin' it! That is just too precious! Thanks for visiting me! Happy WW!